The Charities Review Council’s Annual Forum took place on June 11, 2013. It was an event dedicated to strengthening our community by encouraging all organizations to work collectively in order to implement positive change. 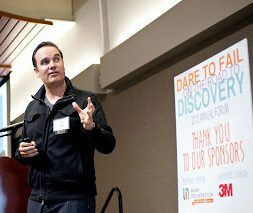 In keeping with this year’s theme: Dare to Fail on the Road to Discovery, attendees were encouraged to share their own experiences of risk-taking and failure. The importance of finding innovative approaches to improve our communities resonated in each speaker’s remarks and the conversations sparked among the attendees themselves. The event opened with music by Youth Performance Company as the crowds gathered to network and enhance cross-sector partnerships within the community. The wide range of organizations in attendance at the Annual Forum reflects the Council’s commitment to engage with the many different communities that form the fabric of Minnesota. Peter Sims, the event’s keynote speaker, is a national best-selling author and his recent book, Little Bets: How Breakthrough Ideas Emerge from Small Discoveries, explores the important role of making ‘little bets’ to achieve successful outcomes. Sims believes that this practice of experimentation can be applied to any sector, including the nonprofit sector, where innovation allows organizations to enhance their collective impact by taking risks together. Sims began by describing how the company Pixar came to be. While illustrating how this innovative company developed, he highlighted the role of small wins that led to momentous discoveries. Sims built on this story to develop a narrative that transcended beyond this one instance of success to find common ground in the experiences of those working in other sectors. In doing so, he emphasized the importance of learning from failures to build toward future successes. The audience, comprised of members of nonprofits, local businesses, government, and community leaders, found common ground in his words. 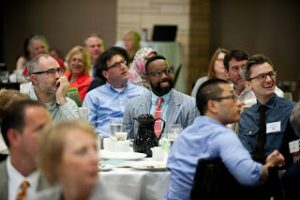 Sims described Minnesota as “the bread basket of philanthropy in the country.” By encouraging nonprofit accountability and informed charitable giving, the greater Minnesota community can continue developing innovative approaches to community improvement. Sims cited passion, vision and a willingness to make ‘little bets’ as important paving stones on the path to positive change, an idea that can be applied to strengthening community initiatives. Sims also acknowledged that setbacks will likely occur along the way, however, these setbacks should be treated as learning opportunities rather than permanent roadblocks. In addition, by reframing our concept of failure, these perceived instances of failure can be transformed into moments of discovery on the quest for innovative solutions in order to more effectively address issue areas in communities. The idea of making ‘little bets’ to achieve positive change deeply resonated in the room, as audience members took turns standing up to share both their own ‘little bets’ as well as their questions prompted by Sims’ research. The audience of over 300 people actively participated in the conversation surrounding making ‘little bets’ by taking to Twitter to share their own experiences as well as reflect upon what they had learned at the Annual Forum. Each tweet was displayed on large screens at each end of the room: a vibrant representation of the commitment of the members of our Minnesota community to encouraging positive change. Just attended the #annualforum13 talking about little bets and being courageous to #daretofail. great job Charities Review! Thanks to @smartgivers and @petersims for a great #annualforum13! How will you #daretofail? Looking for an older article? We're in the process of migrating our blog. If you're looking for an older entry, please visit the archive to search for it.